Montreal creates one of the biggest tradeoffs of the year alongside Spa in terms of sacrificing top speed for cornering ability, which is why many teams bring specific updates for this race. The FIA front wing upper flap test was introduced for Canada (as explained here) and as a result the teams had to modify suitable components to comply. There were a few changes spotted, mostly reinforcements and other detail notches to prevent the flaps flexing too far under load, but it was still clear to see from onboard footage that their wings are still excessively bending at high speed. We should probably expect further clampdowns in the future. Although it was originally rumoured that they would bring updates for the Canadian GP, it was only until a matter of days before the event that Ferrari confirmed that they had a revised power unit. The upgraded unit was only available to the Scuderia, with Sauber expected to switch to the new one following the summer break. Whilst we do not receive any official word as to what the upgraded parts are specifically, we do know that Ferrari have spent three of their remaining nine tokens left for this season. Three tokens is, conveniently, enough to upgrade all things related to the combustion chamber, and that is what the paddock generally believe they have done. This covers the valves and coils, direct fuel injectors, ports, cylinder head, the combustion chamber itself and timing amongst other smaller details. Focusing on this area suggests that Ferrari are so far satisfied with their energy recovery system this year, an area which was often their achilles heel last year at times. Increasing outright power from the ICE and improving fuel efficiency appears to be the goal here. What’s conflicting with this information is, despite Ferrari’s apparent gain in power, they still found themselves 8th in the speed trap classification list during qualifying – all seven cars ahead were Mercedes-powered. The lead Ferrari (Kimi Raikkonen) was at most 1.2kph behind the leading Mercedes of Lewis Hamilton, but 5.1kph off the benchmark set by Romain Grosjean. This shows that the Scuderia are lacking that little bit of performance to that of the three-pointed star. With both Mercedes drivers running over 4kph slower than Grosjean, it reveals just how much more downforce they are able to run, which helps enormously under braking and reduce the effects of tyre degradation. McLaren’s major update is set to arrive for the Austrian GP later this month, but Honda have already brought developments to the power unit by spending two tokens. 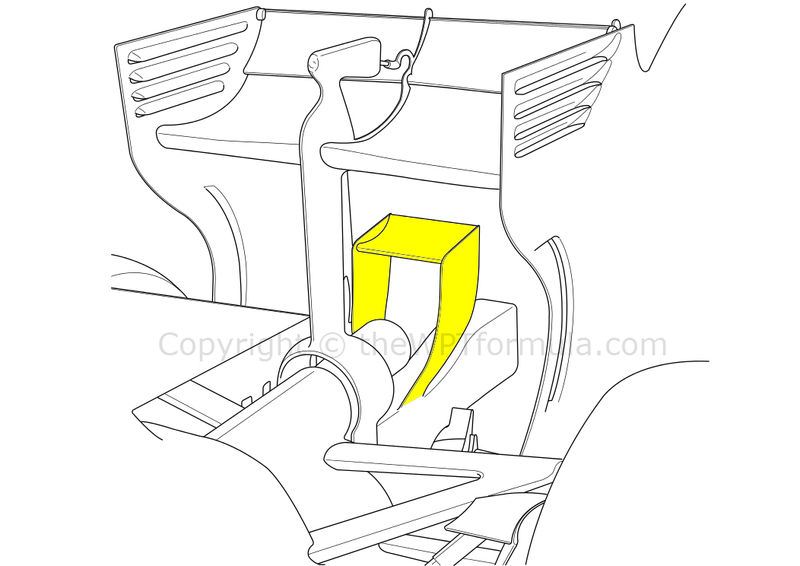 Unlike Ferrari, Honda’s expenditure could cover components such as the turbocharger or either the MGU-K or MGU-H of the hybrid system, although more tokens would have to be spent on neighbouring areas should the former changes be dramatic. The Honda engine lacks both power and reliability so a small step in those areas are needed to help get a better baseline to work on. McLaren’s issues with exploiting the MGU-H are well documented, which is linked to the turbocharger to gather and also use energy to help spool it. It is therefore likely that Honda have adjusted both of these items. Both Jenson Button and Fernando Alonso pulled out of the race with exhaust problems, although it turns out they were unrelated to each other. A number of small updates were visible on the W06, namely alterations made after a successful test session in Barcelona after the grand prix. To cope with the high brake temperatures, some of the ‘cake tin’ bodywork around the hub assembly was trimmed back slightly, leaving both the caliper and the entire disc exposed. This will help heat dissipate from the brakes, whilst also improving tyre heat management. Because of the lack of high speed corners, generating good core tyre temperature becomes quite a difficult task, especially given that the lap is pretty short anyway. This is why we saw some drivers choose to do two laps during qualifying – one to warm up the tyres and the other to set their fast laptime. By removing the bodywork around the brakes, the Mercedes drivers should have better control of their tyre temperatures as heat will transfer more readily onto the wheel rim face and then through the tyre itself. After encountering cooling issues last year, Mercedes also chose to run a larger ERS radiator – a blister was made into the engine cover to clear it, which was the tell-tale sign. The W06 ran with the little ‘ear’ inlets eitherside of the rollhoop during the Barcelona test to compose some back-to-back data with their existing cooling package. Clearly the additional inlets were not needed and that running a larger radiator was actually more efficient. All of the ERS components take a bit of a beating at Canada (and Austria, too, the next race on the calendar) due to the heavy braking and acceleration events. The MGUs are constantly harvesting and dispensing energy so controlling the internal heat buildup is crucial to reliability. The medium downforce rear wing seen in both China and Bahrain was also on hand to reduce drag down the long straights. As the wait continues for Renault to spend even one of their twelve remaining power unit tokens, Red Bull have been forced into making alterations to the RB11 chassis on a continual basis in their bid to recapture some form. The car featured all new sidepods and engine cover bodywork, which are formed from one piece of carbon fibre rather than split up into multiple panels like other teams do. However the back of the sidepods now features a cutout for an interchangeable rear panel to optimise cooling. The sidepods cut downwards quite aggressively at their midpoint, with the engine cover now bulging slightly outwards before also following this new gradient. It appears to replicate the downwash effect the Ferrari sidepods have without the distinctive step on the shoulder – something only Ferrari can achieve thanks to its unique radiator placement. At the rear the canon heat outlets have been raised slightly and actually increased in size. For Canada these outlets flared out in quite an extreme shape but, thanks to the new sidepods/engine cover, these can be interchanged for something smaller if necessary. Up front, the under-chassis turning vanes have been completely revamped with a clear design cue from Mercedes. 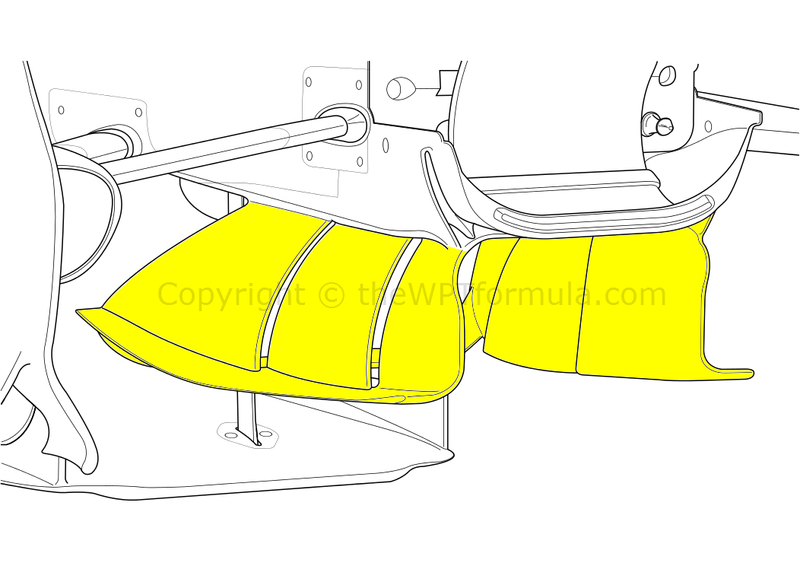 Rather than the two large, curled vanes that many copied previously, Red Bull have resorted to a shorter three element layout all attached to one footplate. This fine-tunes the Y250 vortex running in parallel with the chassis immediately alongside, conditioning the flow around the sides of the car. The vanes also have two horizontal vanes that link the trailing elements of each side, stretching across the underside of the car. This is a new development which we have never seen before – it looks like a flow conditioning device to smoothen air as it passes onto the sidepod undercut. New front brake ducts were also tested on Daniil Kvyat’s car to suit the heavy braking nature of Montreal, which featured an additional element bored ahead of another twisted vane for improve aero efficiency. Interestingly, the RB11 ran without the blown front axle faces for the first time in 2015. Red Bull instead reverted back to the traditional pointed axle end to reduce the outwash effect of the front wing around the front tyres, possibly decreasing drag as a result. To compliment the reduced rear wing angle for this race, Williams introduced an accompanying Y100 monkey seat winglet to help boost rear stability with a reduced drag penalty over the previous specification. The new winglet is made of one single element rather than twin, which was used in Monaco, and its endplates no longer include the horizontal slot that distinguishes the two from eachother as a result. Toro Rosso seem to have a better handle on getting their car to work in low downforce trim than any other team, as they are once again the first to introduce a slim rear wing for Canada and other races such as Spa and Monza. Both the main plane and top flap have been shallowed out, resulting in less drag and greater top speed. As a knock on of these changes the central wing pylon has been extended upwards to reach the re-shaped DRS actuation pod, which is more minimalist in design and tucks down into the top of the main plane. The endplates have also been adjusted, with just two horizontal louvres evident to help reduce wingtip vortices and further decrease drag.